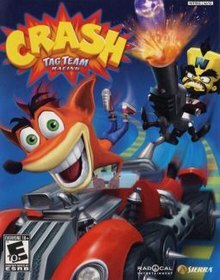 The player takes control of Crash Bandicoot, who must retrieve the Black Power Gem of Ebenezer Von Clutch, along with the missing Power Gems in each of the five themed areas of the park. The player will compete in races and minigames to earn Wumpa Coins, the park’s currency, and Power Crystals, find the Power Gem needed to open up the five areas of the park, and ultimately unveil the mystery of the Power Gem thief’s identity. As the player explores the park, platforming gates can be entered to unlock new platforming, Extra Wumpa Coins and Power Crystals can be earned by playing platforming, all of which involve platforming Characters with an icon over their heads can be talked to unlock cars, weapon upgrades, clothing, or to play minigames. The player can smash crates and collect Wumpa Coins in order to buy rewards such as new clothing; drinking Wumpa Whip gives the player a temporary coin multiplier that earns extra money from Wumpa Coins and crates. Collecting Power Crystals is required to unlock the Power Gem at the end of a themed area, which unlocks an additional area of the theme park. Mini-cartoons, called “Die-O-Ramas”, can also be unlocked; these cutscenes display Crash being “killed” off in various (or getting hurt), and largely humorous ways. Unlocking all 34 Die-O-Ramas unlocks another costume for Crash. The Die-O-Ramas can be viewed at any time under the Extras section in the main menu.